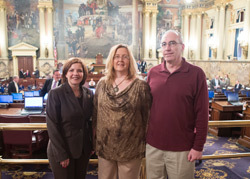 Richard and Linda Horner of Rimersburg once again joined Rep. Donna Oberlander (R-Clarion/Armstrong) at the state Capitol to celebrate unanimous passage of House Resolution 726 to officially recognize April as Esophageal Cancer Prevention and Awareness Month in Pennsylvania. April 2014 marks the third consecutive year that Oberlander’s resolution has been adopted by the PA House unanimously. HARRISBURG – Sponsored by Rep. Donna Oberlander (R-Clarion/Armstrong), a resolution officially recognizing April 2014 as Esophageal Cancer Awareness and Prevention Month in Pennsylvania was unanimously adopted by the Pennsylvania House of Representatives on April 2. Final passage of House Resolution 726 marks the third consecutive year that Oberlander’s resolution has been unanimously adopted to raise awareness of the devastating effects of esophageal cancer. Oberlander first introduced this resolution due to the request of two of her constituents, Linda and Richard Horner of Rimersburg. The entire Horner family has been actively promoting awareness of esophageal cancer ever since Richard was diagnosed with the disease in 2008. One of the most common causes of esophageal cancer is chronic heartburn, or gastro esophageal reflux disease (GERD), although poor health habits such as excessive drinking and smoking may also play a part in the development of this deadly disease. Such chronic health problems may also lead to a condition called Barrett’s Esophagus, which makes an individual 125 percent more likely to develop esophageal cancer. However, with monitoring and treatment of GERD, the potential for long-term irreversible damage leading to esophageal cancer can be avoided. For more information on esophageal cancer, the Horner’s encourage those who suffer from chronic heartburn to visit www.ecan.org or contact their doctor.